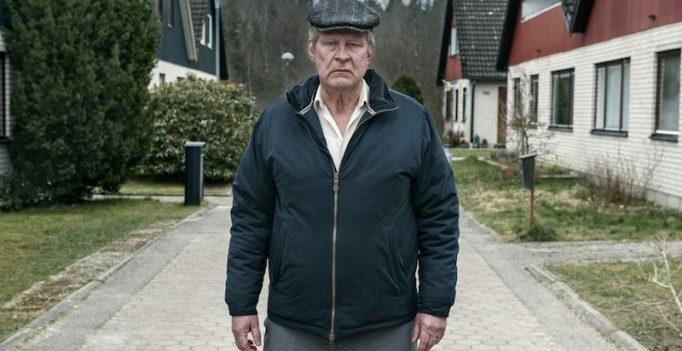 A Man Called Ove, adapted from the novel by Frederik Backman, is a charming, yet slightly familiar dramedy about a grieving widow and his budding friendship with his new neighbours in a gated community. Recently nominated for two Academy Awards (Best Foreign Language Film and Best Makeup), Hannes Holm’s adaptation is a digestible and likeable, but hardly transcendent film. Depressed after losing his wife, Sonja (Ida Engvoll) and his job, Ove (a great performance by Rolf Lassgård) becomes suicidal. After his attempts to kill himself are repeatedly and unintentionally foiled by his fellow gated community neighbours, he softens up and becomes friends with his new neighbour, Parvaneh (Bahar Pars), her husband Patrick (Tobias Almborg), and their two children, Sepideh (Nelly Jamarani) and Nasanin (Zozan Akgun). A Man Called Ove charts familiar territory in the prestige “foreign” language film market; recalling the inexplicably crowd-pleasing yet aggressively mediocre French film The Intouchables (2011), the film perhaps much more implicitly covers the political and social mending of racial divides, expressed through the mediating of a cynical white Swedish native on the cusp of seniority and a younger immigrant coded as “the Other” (in this case, of Iranian origin). Though A Man Called Ove never becomes as overhanded with this subtext as The Intouchables, this narrative is nonetheless becoming quickly exhausted, even outside of the hybrid comedy/drama genre. However, Rolf Lassgård’s sympathetic portrayal of a man with suicidal tendencies makes the film much more compelling than The Intouchables, and a more grounded screenplay by Hannes Holm also gives the film a much grittier and melancholic edge than those of its ilk.